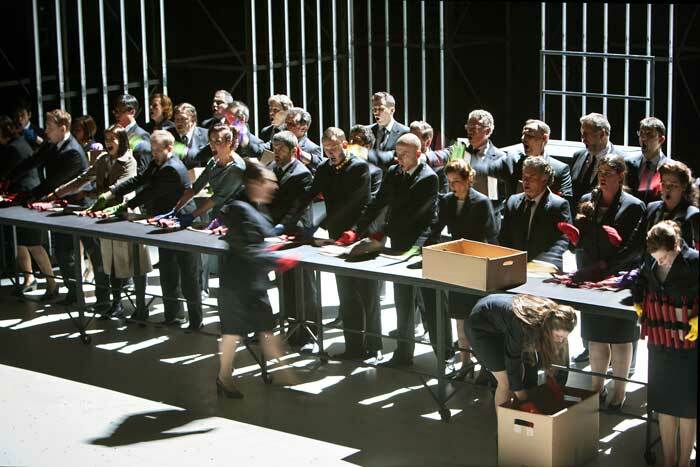 This was a new production by Opera Vlaanderen, in conjunction with the Nationaltheater Mannheim, directed by Peter Konwitschny. Russell Burdekin saw the première and has provided the following. La Juive was one of the grandest of the Paris grand operas with one newspaper commenting on the enormous Act 1 procession that "The Opéra may become a power capable of throwing its armies into the balance of power in Europe". The libretto by Scribe was typical of his style with an unlikely series of events and coincidences vaguely based on historical incidents, in this case in 15th century Constance, and culminating in a sensational ending. 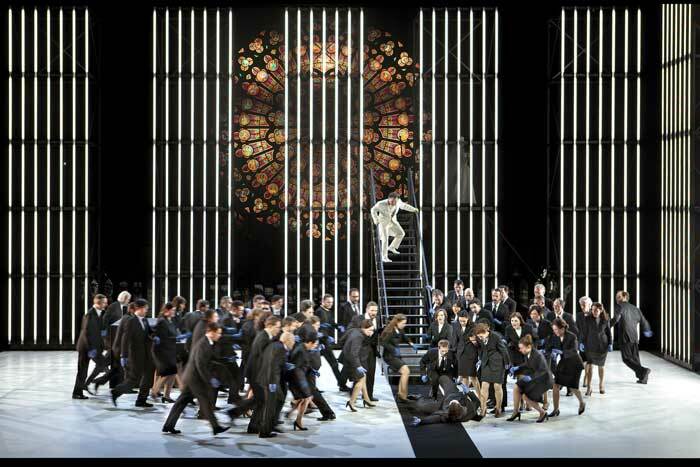 The opera is a rare beast today and I was particularly interested that Opera Vlaanderen had hired Peter Konwitschny as the director, who is noted for his radical interpretations. 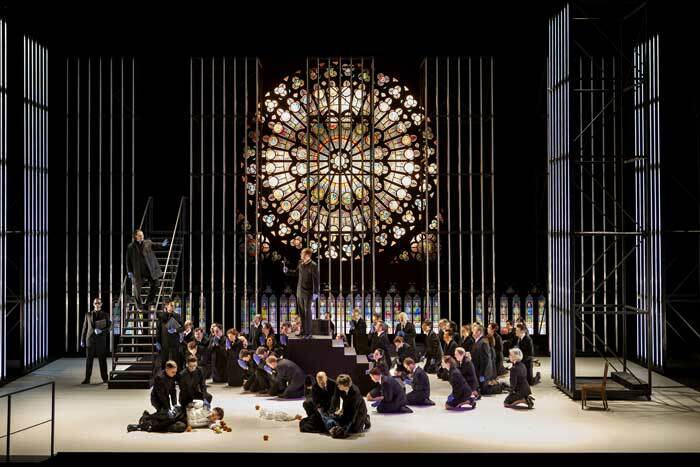 To complement the opera, Opera Vlaanderen had also organised a two day conference on Judaism in Opera, during which Konwitschny discussed some of his decisions. Konwitschny saw the opera not primarily as Christian and Jew but as persecuting majority and persecuted minority, an essay in intolerance. 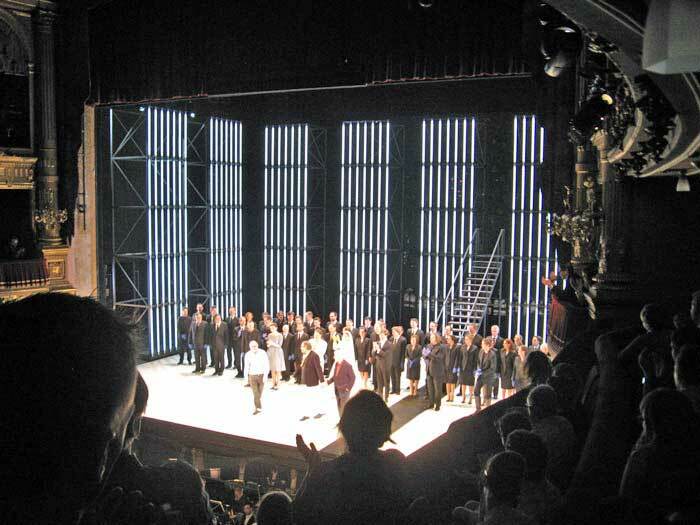 He clearly aimed at achieving a dramatic evening rather than a faithful rendering of the opera and indulged in quite substantial cutting and reordering of episodes. The set was fairly minimal and functional with no indication of time or place. All the roles were strongly delineated, even Eudoxie who can be a somewhat shadowy figure, and all were acted with great energy and commitment. 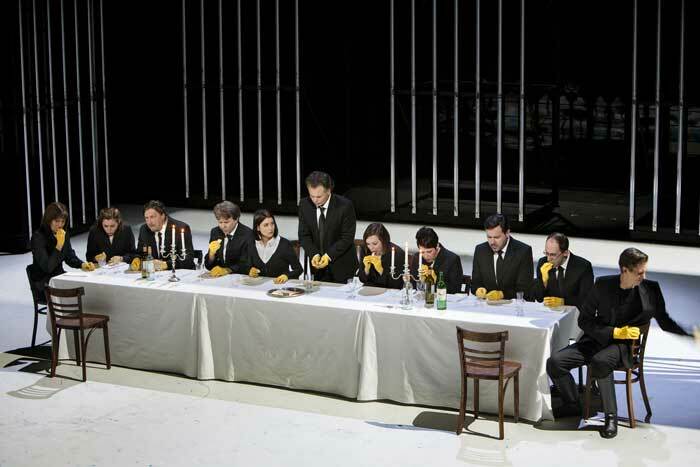 The singing (Eléazar – Roberto Sacca, Rachel - Asmik Grigorian, de Brogni – Dmitry Ulyanov, Léopold – Randall Bills, Eudoxie - Nicole Chevalier, Ruggiero – Toby Girling) was excellent particularly when one considers the very physical acting that they were often asked to do at the same time and the whole enterprise was well supported by the orchestra under Tomás Netopil. 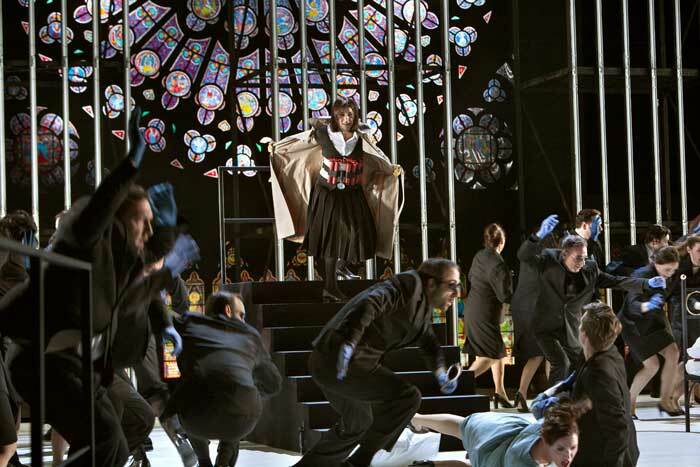 While some opera fans will no doubt decry Konwitschny’s manipulation of the opera, it was all in all an intense and exhilarating evening and the audience clearly appreciated it. A fuller review was included in Newsletter 125, June 2015. The singers in the photographs are the first named in the cast list.